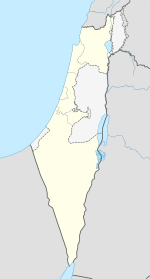 Yavne (Ebreu: יַבְנֶה‬) is a ceety in the Central Destrict o Israel. In 2015 the ceety haed a population o 42,314. Twalt-century tomb in Yavne attributit tae baith Rabbi Gamaliel of Yavne an Abu Hurairah, a Companion o Muhammad. Yavne wis ane o the major auncient ceeties in the soothren coastal plain, situatit 20 km (12.43 mi) sooth o Jaffa, 15 km (9.32 mi) north o Ashdod, an 7 km (4.35 mi) east o the Mediterranean. Excavations wur carried oot on the auncient raised tel which developed on a naitural kurkar hill. The tel wis inhabitit, possibly continuously, till the Breetish Mandate period. Durin some periods, especially the Byzantine period, dounset expandit tae cover pairt o the plain an hills surroondin the tel. Salvage excavations carried oot in 2001 bi the Israel Antiquities Authority uncovered several burials at the northren fuit o the oreeginal tel. Maist o the burials are datit tae the later Iron Age. Ane burial pynts tae a late Bronze Age occupation. The Bible refers tae Yavne'el (15:11 Joshua 15:11) (whiles transliteratit as Jebneel), a border ceety atween the tribal allotments o Judah an Dan. In Roman times, the ceety wis kent as Iamnia. It wis bequeathed bi Keeng Herod upon his daith tae his sister Salome. Upon her daith it passed tae Caesar Augustus who managed it as a private imperial estate, a status it wis tae maintain for at least a century. Efter the destruction o the Seicont Temple in 70 CE, Rabban Yochanan Ben Zakkai muivit the Sanhedrin tae Yavne. Some scholars believe the Cooncil o Yavne met thare. The Sanhedrin left Yavne for Usha in 80 CE an returned in 116 CE. Byzantine period fynds frae excavations include an aqueduct east o the tel, an a kiln. In 2007, remains rangin frae the Early Islamic period til the Breetish Mandate period wur uncovered. An additional kiln, an pairt o a commercial/industrial aurie wur uncovered at the wast o the tel in 2009. The Crusaders cried the ceety Ibelin an biggit a castle thare in 1141. Its namesake noble faimily, Ibelin, wis important in the Kinrick o Jerusalem an later in the Kinrick o Cyprus. Ibelin wis captured bi Saladin in 1187. Salvage excavations at the wast o the tel unearthed a stash o 53 Crusader coins o the 12t an 13t centuries. Maqam Abu Hurayra, describit as "ane o the finest domed mausoleums in Palestine", is locatit in Yavne. Syne the 12t century, it haes been kent as a tomb o Abu Hurairah, a companion (sahaba) o the Islamic prophet Muhammad. Efter 1948 the shrine haes been taken ower bi Sephardic Jews who believe that the tomb is the burial place o Rabbi Gamaliel o Yavne. Afore the establishment o Israel, the Arab veelage o Yibna wis locatit thare. In salvage excavations in 2001–2002, remains o the pre-state toun wur uncovered. Accordin tae the Israel Central Bureau o Statistics (CBS), in 2001 the ethnic makeup o the ceety wis Jewish an ithers, athoot significant Arab population. In 2001, the population includit 15,800 men an 16,000 weemen. The population growth rate in 2001 wis 0.5%. 103 new residents muivit tae Yavne in that year. In 2000, thare wur 10,910 salaried wirkers an 966 sel-employed. The mean monthly wage for a salaried wirker wis ILS 5,699. Salaried men haed a mean monthly wage o ILS 7,430 compared tae ILS 4,042 for weemen. The mean income for the sel-employed wis 7,631. 640 ceetizens received unemployment benefits an 2,396 received an income guarantee. Accordin tae CBS figures for 2001, thare wur 16 schuils an 7,445 students in Yavne (11 elementary schuils wi 4,037 students an 9 heich schuils wi 3,408 students). 59.6% o 12t graders wur entitled tae a matriculation certificate that year. Major companies based in Yavne include: Ormat Industries, Aeronautics Defense Systems, Avisar an Orbotech. Maccabi Yavne is the ceety's major fitbaa club. Durin the 1980s the club played in the tap diveesion an in 1985 wan the Toto Cup. The day thay are in Liga Leumit. an the basketbaw team, Elitzur Yavne play in the Liga Leumit (basketbaw) syne 2007. Omri Casspi, the first Israeli tae play in the Naitional Basketball Association grew up in the ceety an played for some o its teams. ↑ Kletter, Raz (2004). "Tel Yavne". Excavations and Surveys in Israel. 116. Retrieved 2010-08-08. ↑ Velednizki, Noy (2004). "Yavne Final Report". Excavations and Surveys in Israel. 116. Retrieved 2010-08-08. ↑ Sion, Ofer (2005). "Yavne Final Report". Excavations and Surveys in Israel. 117. Retrieved 2010-08-08. ↑ Volynsky, Felix (2009). "Tel Yavne Final Report". Excavations and Surveys in Israel. 121. Retrieved 2010-08-08. ↑ Mayer et al., (1950:22) Cited in Petersen, Andrew (2002). A Gazetteer of Buildings in Muslim Palestine: Volume I (British Academy Monographs in Archaeology). Oxford University Press. p. 313. ISBN 9780197270110. ↑ Buchennino, Aviva (2006). "Yavne Final Report". Excavations and Surveys in Israel. 118. Retrieved 2010-08-10. Wikimedia Commons haes media relatit tae Yavne. This page wis last eeditit on 6 Juin 2018, at 17:42.